Kent Mountford, PhD, is an estuarine ecologist with 36 years experience focused on North Americas mid-Atlantic temperate estuaries. A writer, lecturer, and sailor, Dr. Mountford has been employed as a scientist for the District of Columbia and the US Environmental Protection Agency. As a working scientist he spent a decade and a half studying productivity and ecology of coastal plankton systems. In 1980, he looked at the then-polluted Potomac, and began investigating the regions early colonial literature as a key to understanding todays problems. He helped set foundations for using ecosystem models to manage the Chesapeake; these models were among the first to simulate the bays pre-colonial state and forecast the importance of nitrogen pollution. Dr. Mountford served on the Chesapeake Bay Programs management committee and was influential in the Districts becoming a partner in the emerging multi-state effort to restore the Chesapeake and her rivers. He wrote the mayors speech for the 1983 Governors Conference which started the federal Chesapeake Bay implementation effort. When the Chesapeake Bay Program concluded its six-year research phase in 1983-84, Mountford joined the U.S. Environmental Protection Agencys new Bay Program Office to coordinate its estuary-wide monitoring program  now broadly accepted as the most comprehensive and enduring such program in America. In 1985 he co-convened with NOAA a symposium on the ecological history of Chesapeake Bay which became a dedicated issue of the Journal of the Washington Academy of Sciences (September 1996). Mountford spent the balance of his 16 years at EPA as Bay Program Senior Environmental Scientist where his knowledge of the Bay was widely acknowledged. He managed a number of university research grants and administered EPAs multimillion dollar contributions to non-point pollution control in Virginia for 6 years. He headed early efforts to develop "Environmental Indicators," a program now nationally recognized  and for this work received EPAs Regional Bronze Medal. He directed development of a touch-screen multimedia educational kiosk called "Touch the Bay". Dr. Mountford's public information role found him frequently quoted in the media, appearing on TV news spots or radio talk shows. He is an engaging naturalist-lecturer with a sense of humor and a particular sensitivity for historical context. His lectures have been illustrated from his own archive of 14,000 color slides. Dr. Mountford has published dozens of papers and articles addressed to both scientific and general readers. Since 1997 he has written "Past as Prologue," a popular column on Chesapeake environmental history, in the Alliance for Chesapeake Bays Bay Journal, which reaches a monthly audience exceeding 55,000. 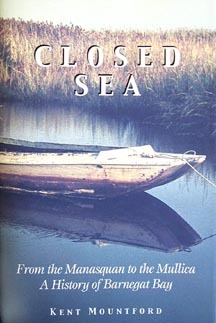 He is a chapter co-author with V. S. Kennedy for the ecological history Discovering the Chesapeake (Johns Hopkins Press, 2001). Dr. Mountford was raised a native New Jerseyan, spending each youthful summer at the Shore and the early core of his professional life on Barnegat Bay. He received his Masters in 1969 and his PhD in 1971, both from Rutgers, New Brunswick, where he received his undergraduate degree in 1960. He has been a sailor for fifty years and a licensed U.S. Coast Guard captain since 1987. His half century of logbooks, filled with experiences and sketches, cover some 35,000 miles sailing his in own boats and those of others across waters domestic and foreign. With his wife of 31 years, Nancy, he lives on one of the Chesapeake's most beautiful tributaries and, from an office overlooking his boat moored in her cove continues to write, lecture about, and study coastal history and ecology.